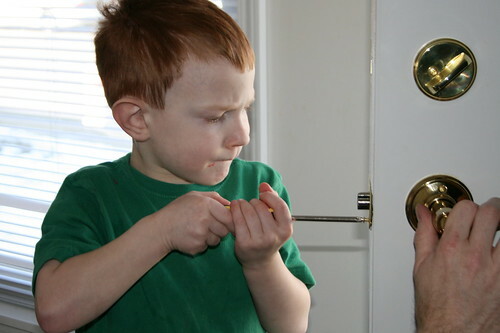 Kade is learning to be a handyman like his dad. Today Amanda and Chris moved into their first house. Mickey helped with the loading and unloading of the truck and the kids and I showed up later to help unpack and clean. It was decided that the locks needed to be changed. The men went off to buy the supplies. Kade was right there in the middle of things for the first door. He was thrilled he was allowed to use the tools. I'm sure he'll need a refresher course for the next locks he changes. The girls were no slouches. They were running things up and down the stairs, vacuuming, and chowing down on red vines until they needed a movie break. I unpacked most of the kitchen. Pictures of these events were taken but did not turn out clear so Kade gets to star in another potd. Good thing he's cute. You gotta love that expression of total concentration. Yes, there was lots of good help on Saturday. Maybe it was a primer for the next move that will be happening in our family. Good luck finding a new house!